So here is a screen shot of the temperature software screen. Here you can see my nominal value is 28 degrees and the hys is set to .02 meaning the tank will only fluctuate by .02, my graphing clearly shows this as an even saw tooth over a 24 hours period. Any more switching than this in a small tank that does not hold heat well could cause thermostat bounce, something to be aware of more so with chillers. So thats the input but what about turning the heater on and off at the set value? Next step is to program the power bar to control the heater, but first set the thermostat of your heater to 1-2 degrees above your nominal value, this is so the GHL had control over the heater but still allowing for failure redundancy, no matter how good your controller is, it could be made by Nasa for all I care, make sure you have redundancy or 3rd party cut out for such devices. Ok onto the power bar. here you can see the power bar input screen and I have chosen socket 1 to be the temperature "heating" control socket. The socket is edited to be Temperature 1 - Heater. If you want to also control a chiller just select another socket i.e socket 2 and program that to Temperature 1 - Chiller. 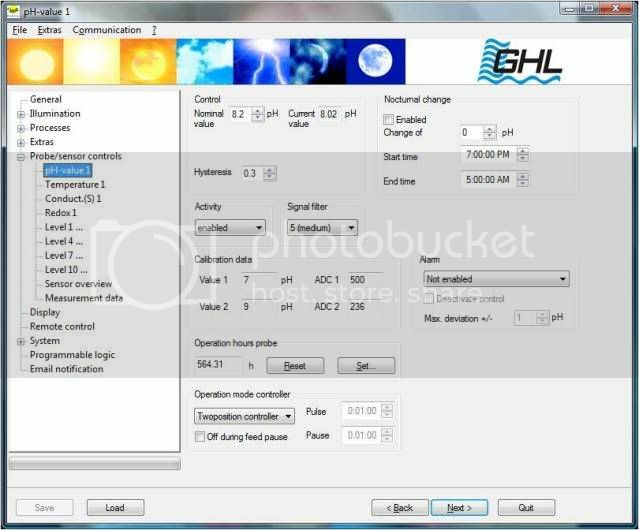 The ProfiLux will then turn either device on or off depending on your nominal value and Hys' set. More about the other sockets later. Well once you have set up the Temp everything stat to fall into place like a jigsaw really, setting pH up is no different you are just dealing with different values. Just as the temperature control page, you have nominal value current value and hys'. As with the temp input there are plenty of other funky add ons to play with if you wished here, for example nocturnal mode etc, this is important only if you really do not like natures ability to lower pH at night, I personally let the tank follow a rythm. So what can pH be used for? In my case its just monitoring, of course I can set an alarm to wake me at 2am if it drops too low, or goes to high if my Alk dosing got stuck on, or if running a kalk stirrer etc. 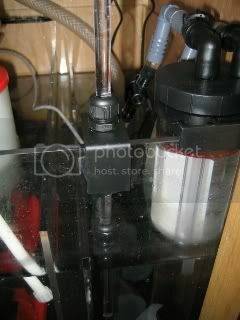 But the main purpose in reef tanks for pH control other than just monitoring the tank is calcium reactor control. First set up your nominal value in a ca reactor it should be around 6.2 to 6.5 depending on your media. The Hys' can be set to 0.1 in this case, we are controlling a solenoid so does not have so many issues with being switched on and off often. Now go back to the socket function screen and decide what socket you wish the solenoid to be plugged into, lets say socket 2 for now. If you want to control a Kalk stirrer you can do the same but opposite, if the pH drops you want the kalk to be turned on so set to pH up. Next Salinity control - Oh thats a scary one. Lets look at what the old trusted refractometer is really designed for? Reading NSW? Nope, reading wee? Yep, Reading NACL? YES, but NOT natural salt water! To do this you must calibrate the refractometer using an NSW solution, the most trusted until recently was Pinpoint 53mS but then along came Fauna Marin with its highly technical "multi reference test solution" I strongly recommend anyone getting a GHL salinity probe and wish to match its reading to a refractometer to get this stuff. We are getting a bit deep here and away from reviewing the ProfiLux but what i am trying to say is do not panic if you see the GHL reading different then the old trusted dog the refract' calibrate the refract correctly and you will not see much of a difference. My refract - digital pen and GHL probe is calibrated to fauna solution at 53mS. This does not mean the GHL stuff is innacurate at 50Ms it is just no good for calibrating a refractometer. So if you want to match both you need an NSW solution for the refract. OK so we have follwed the calibration instructions to the letter (mega important) so now what can we do with salinity control? 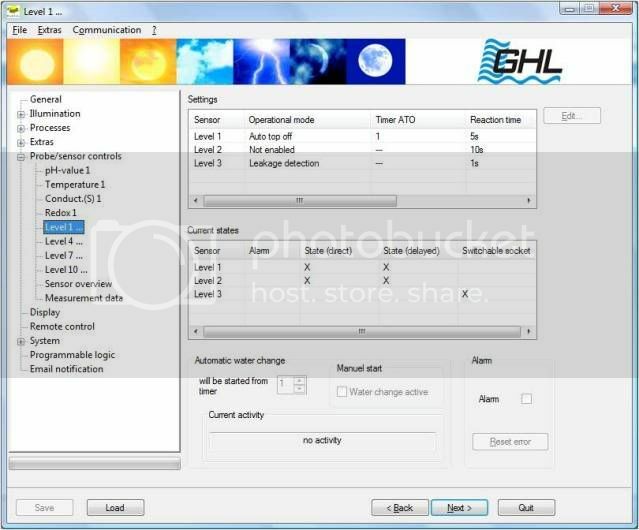 I do not personally do this but I know many GHL users do and that is control their ATO based on the salinity level of the tank. I am not going to touch on setting this up here to control ATO, if you wish to do this then let me know and once the review is finished I will discuss more detailed subjects. And next is level control ATO and AWC and alarms. So which ever you choose of the first two the only thing that changes in the set up is what you plug into the assigned power bar socket, whether it be a water solenoid of water pump. In my case water solenoid. So first thing we must do is set a float or optical level sensor up in the sump to the desired (controlled) level point. Set up the assembly and loose fit to the sump so it can be adjusted, now go to the profilux front screen and go to level - diagnostic - level 1, adjust the sensor until it just turns off, you now have your level set at where you wish the water to always be maintained at. So back to the software. By now you should have plugged in your sensor to the back of the profilux and not by mistake plugged it into the temperature port instead!! next in the same screen you need to set up the reaction time, no this is not the time you have to get back from Cuba to sort out the mess in the apartment below, but the amount of time the sensor is active before the controlled socket is switched, this is ideal for tanks with turbulance or other things that can make the sensor switch on and off periodically. I have mine set to 5 secs, which is just right. So thats the ATO sensor set up, what about the socket? You have now chosen a socket to control your pump or solenoid. 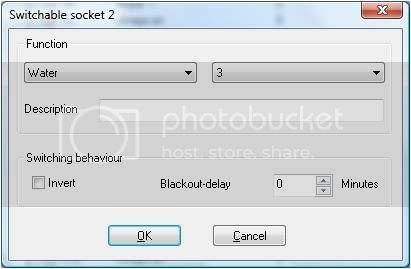 Just as before go to socket function and click edit the chosen socket. Set this to water 1. So for the topic tonight - water alarms. Depending on the amount of sensors you have depends on how many alarm states you can create. I have main tank ovefill alarm and max on time ATO alarm and here i will show you how to create an alarm and shut off for the main pump if the drain got blocked. As you can see from the photo I have attached a float level sensor to the Euro brace inside the weir box, the sensor will then be triggered if the water level rises too high, in doing so setting off an alarm and turning off the main pump. You can set the same thing up for low water in your sump by putting the sensor there instead, mounted differently of course. First connect the sensor to a level sensor port. 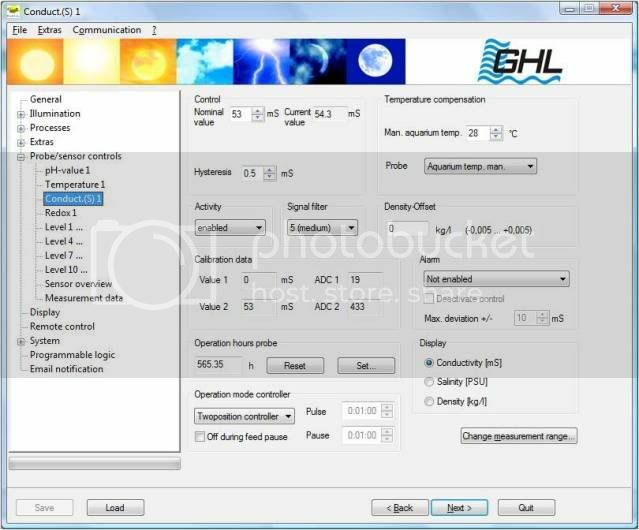 Now go to level control in the software and select the sensor for editing. Set the sensor to leakage detection and set your max on times etc as you choose. Here you will see I am using sensor 3 so have programmed as water 3. If using an optical sensor, when setting up the socket fnction remember to "invert" the socket function. can i have your opinion? So i have a diy led system using 21 cree xpgs running on a 24 volt 4A dimming multi voltage power supply. I have it running on a standard magnetic house dimmer. Do you think a setup like this could work with the profilux? for you system however it all depends on how the power supply dims the LED's, where does it get the driving signal from?